Saint Lucia covers a land area of 617 km2 and is the home of close to 200.000 citizens of which 85.3% are Black, 10.9% Mixed, 2.2% Indian and 1.6% Others. 96% are Christians while 2% are Rastafarian. The French were the island's first European settlers. They signed a treaty with the native Island Caribs in 1660. England took control of the island from 1663 to 1667. In ensuing years, it was at war with France fourteen times, and rule of the island changed frequently (it was ruled seven times each by the French and British). In 1814, the British took definitive control of the island. 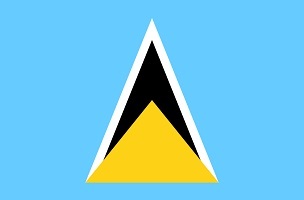 On 22 February 1979, Saint Lucia became an independent state. The volcanic island of Saint Lucia is more mountainous than most Caribbean islands, with the highest point being Mount Gimie, at 950 metres. The local climate is tropical, and with the mountains, that form some great nature. The mammals are made up by the invasive agouti and some bats, here are two amphibians while the reptilians count four snakes, three lizards, one iguana, three Anolis, a skink and five geckos. Here is a single tortoise; Red-footed tortoise. Here are around 170 different species of birds. The flora counts 1300 wild flowering plant species and 150 species of ferns. 6/4 2019. After a way to early start in Dominica, I spend one hour in Barbados before I eventually get to Saint Lucia. Immigration and custom is fast, and half a meter outside the customs sliding doors, I find my car agent. Once again, I get a new driving license, and this one is a bit steep. I drive straight to my hotel, which actually is where it supposed to be. I drop the bag, and before eleven, I'm out on new adventures. Well, I stop at a big supermarket to restock supper for some days, and then I head down south, along the western coast. It is a real lush and green country I meet. In contrast to Dominica, all the houses have their roofs, and it just seem more organised. The country side houses are still mainly made up in wood, but more neat. Here are quite some farming, and bananas are their second biggest income after tourism. A huge meadow only houses a few cows, but it might be too wet for anything else. I reach Marigot Bay, which seems to be the rich's playground. I start with lunch - in the car, as it start to rain. In-between light showers, I find my way around huge ships, mangrove with small colourful crabs and fancy restaurants. On the pier, a rather not-so-posh barbershop is open - to all sides. I head further south, through some banana plantations, but mainly wild nature. Here are some incredible views down to the sea, when the road leads over the coastal hills. I do a lot of stops, but one thing is to see the great looking coastline or mountains through bushes, another to capture it on camera! Next planned stop is the little fishing village of Anse La Raye. It is found at a river mouth, and most buildings are old wooden huts. They are use to tourists, to judge after the amount of souvenir shops behind the harbour-beach, but I'm the only pale around now. I spend some time, waiting for the rain to stop, and the sun to get on again. The colourful boats on the dark sand, under the palms make great motives. I chat with a fisherman mending his nets while I wait. The Frigatebirds are getting close, and I almost get a good picture. Then I turn into the little, cosy village, and end up at the square. A big playground and the local grocery. Old school: Everything behind the counter on one big wall. Further south, the slightly bigger Cananes is found. The road to there is a adventure by it self. It twist its way around the coastal mountains, and some of them are rather dry. I even see some Cereus cacti. Here are probably more interesting plants, but after more than two months in the Caribbean, I have seen most. Cananes is quite alike Anse La Raye, with the fishing boats on the sandy beach and the wooden houses, just bigger. And here are a few more posh houses. Again, I have to wait for the sun, but it is surely worth it. I follow the beach to the river, and loop back along the beach among the seagulls. I head a bit further south, but turn around to get back to Millet Bird Sanctuary. It is found inland, and again, it is a magnificent drive through the green mountains. The road soon turn into a smooth gravel road, and here is mainly pure nature on the sides of the road. Then it kind of vanishes, and I have to turn around. Guess it was not restored after last hurricane? I have to head further up north, but then a road leads deep into the fantastic hills and mountains. The first part is through quite some farmland. Besides from the numerous bananas, here are all kind of vegetables, even in plastic tunnels. I find the Millet Bird Sanctuary, but it appears to be closed. A gravel road leads bye some small farmers, and I walk pass pigs, goats and cows. It leads through dense and green rainforest, and I get actually too fare, before I turn around. Here are a wide array of birds, but I don't try to get any photos. I head home to cook and work, and I am beginning to feel, I was up before three this morning. I have a big room with balcony, and access to a big common room with well equipment kitchen, and I rather cook my self, than chase a crappy vegetarian super somewhere in town. 7. I head down the western coast to where I left yesterday. My first planned target is Anse Chastanet, and I really have to pull myself together not to make a lot of photos of the fantastic coastal road on the way. Here are so green, lots of real pointy mountain peaks, covered in greenery though and the sea. The surroundings turn into true rainforest before I reach the bigger town of Soufriere, and just before, I turn right, along the coast. Here, I find Anse Chastanet, which should be "a magic tropical paradise", but I think that is based on the resorts pamphlet. Here is a narrow beach, filled with parasols, a diving company and the resort in general. I do a walk along the water, which is crystal clear. I see some of the local Anolis; The St. Lucia anole; Anolis luciae. I jump some rocks at the end of the beach, and get to a little road, winding its way between the vertical cliffs and the sea. Here are a few Cereus and a strange flowering tree, probably invasive. Slightly disappointed, I return to Soufriere, which is a rather large town. It use to be the capital, before the Englishmen shifted it. That means a lot of old wooden houses have been preserved, mainly due to the lack of funds. I find the harbour, which is a bit Sunday-dead. Some of the locals are playing Domino for money, and take it real serious. The rain that keep me in the car at Morne Tabac Rainforest Trail have now found its way down here, and I make a tea stop. Then I do a loop around the old part of town - which is pretty much all of it. Next to the river, the houses are real bad, but still charming. Saint Lucia is by the way the first island in Caribbean, I have experienced both kids and adults begging for money. And they are not shy: Do you have money? Give me a dollar! and so on. It lightens up a bit, and I head back to Morne Tabac Rainforest Trail, and the road is dry all the way. Then, when I open the door, it start poring down. Well, there are more low coastline, which more likely will be dry. On the other side of Soufriere, "The World's Only Drive In Volcano" is found, and despite it is a lie, I give it a go. On one side of the ancient Soufriere volcano, some sulphur is oozing out, creating steam and bobbling ponds. This is where all the medium sized busses with cruisers have gone. They line up to be covered in white and black mud, while there are next to none at the thermal activity. Well, I don't blame them: It is only a few black mud ponds, less then 25 square meters each, and some noisy cascades of steam. I wait for quite some time for the sun, but it is not really present. I give up, and continues down south, this time to the trail in the Piton area. The Pitons are two iconic volcano cones, visible from most of the island. I find a smaller road, leading the right way, and it is a joy, despite the gloomy weather. It crosses several rivers, some of them several times. It is through dense rainforest, and here are little settlement. That pretty much round-up my west coast sights, and I just follow the coastal road down to the south. The road leads out to the steep coastal cliffs, and the area get real dry. It is mainly yellow grass, and here are the remains of several old windmills. I find a few small sandy beaches and a bit of mangrove in the river mouth, and here are Cereus. I reach Choiseol and its harbour. Many of the small houses in the village is old wooden ones, and the church is mainly made in wood too. The little harbour is fenced in, and I have to follow a kid, to see where there are a hole in the fence. The fishers are at the pier, but activity is low. I follow the beach to the river, which is a lagoon. The houses here are small and in a bad state. I continues, and on the hillsides, way better and bigger houses are found. Another beach turns up, but the river have spitted it, and I don't get to the seaside. Further down is Vieux Fort, a rather big and modern city. The southern peninsular is closed off, and I I thought is was a industrial or military area, but it pure hotels and resorts. I turn around, but follow the eastern coast homewards. It have several large, perfect sandy beaches and a international airport. I guess this is where they keep the tourists? The coastal area is pretty dry, and here might be some interesting plants. But I am running out of time, and I would like to visit Mamiku Botanical Garden, while I'm here. "Open seven days a week, from 9-5", but is this the eight day??? Well, it does not look so great from the outside anyway. I stop a few times for great coastal views, and turn into the little fishing town of Dennery. It have a limestone island out in the bay - unless it too is volcanic. The harbour is quite big, but the boats are still just rowing-boats with small engines.